The 2048, 9048, & 9788 nibs are usually listed as Shaded Writing. I have only the 9048 but cannot figure out what shaded writing should look like or how to make it happen. Is it necessary to use pressure to spread the tines a bit on the down strokes? That would be my guess. Both the Snyder Esterbrook nib chart and the Anderson Pens site list all three as being "flexible" and the 9788 was listed on one of them as being an "extra flexible medium" (the other two are listed as bing "flexible fine" nibs. The 9048 is not nearly as flexible as my Waterman 0552. Guess I'll have to exert more pressure, slowly. Utilizing flexible nibs is simple but not, apparently, easy, as so many have trouble with it. Just press on the downstroke and lift on the upstroke. That's about it. flexible -- pen flexes to a BB with some pressure, a BBB with significant pressure -- more pressure than is comfortable to write more than a few words. If you want to learn how to use a flexible nib it would be best to get some dip pens and fool with them, they are the cheap way to learn. Real flex is expensive and fragile. Esterbrook did not make real flex nibs but my current Estie writer has a 9048 nib and is a pleasure to write with. That said, I’ve heard others say they have a nib that truly is flexible. I imagine that there is variability among the nibs with some being softer than others. But I dare say none are really flexible compared to Esterbrook’s original dip pens. I’ve used a few of their Durachrome (stainless) dip nibs which are basically thenRenewPoints without feeds. The material is not nearly as flexible as the non-stainless steel. In other words, I suspect there’s an inherent limitation in the nib material. Try them out, and enjoy them for what they are, but realize what they’ll never be. 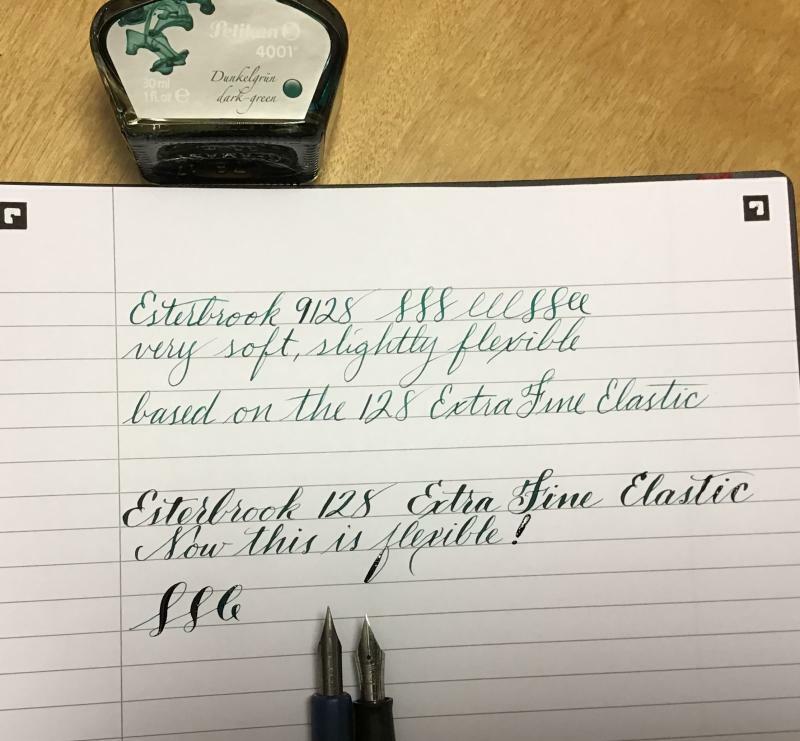 I've never run across an Esterbrook nib that was any better that "sort of flexible". Those nibs were not the best of Esterbrook's choice. Maybe the early dip pens were, but not the re-new nibs. I really don't like the 9128 at all. 9128 is a decent extra fine, for me. I wonder if any of these Esterbrooks listed as flexible would become more flexible with use. I find the same to be true for the 9048 when using my normal writing pressure.I am amazed at the variation of writing styles provided by a half dozen Esterbrook nibs.